Definition of Mass Numbers: All atoms have a mass number which is derived from calculating the sum of the total number of neutrons and protons in an atomic nucleus of a particular atom. It is necessary to establish the atomic weight to enable you to establish the Mass Number. 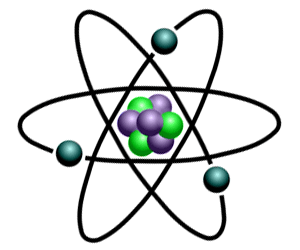 The atomic weight or mass is, basically, a measurement of the total number of particles in an atom's nucleus. Using the Mass Number you will be able to calculate the number of Neutrons in an atom. The mass number is established by rounding the atomic weight to the nearest whole number. The Periodic Table with Atomic Mass will give you the atomic weight, or atomic mass, of the elements. The chemical properties of an element are determined by its Atomic Number not its Mass Number which is why atomic numbers are shown on the Periodic table whilst Mass Numbers are not. Mass numbers equal the total number of heavy, or massive, particles in the nucleus. Subtracting the Atomic number from the Mass Number equals the number of neutrons in the nucleus. So, if we know the number of protons and neutrons in an atom we can determine the mass number. The unique chart below has been created by www.elementalmatter.info and details all of the elements in the Periodic table, the numbers of protons, the numbers of neutrons and the mass numbers of atoms which relate to the elements. The following examples provide details of how to calculate the mass number. Example 1 - mass number of Gold: The element Gold (Symbol Au) has the Atomic Number of 79. The number of protons in atom of gold is therefore 79. Gold has the Atomic Mass weight of 196.97. Round to the nearest whole number. The mass number of gold is therefore 197. Example 2 - mass number of Silver: The element Silver (Symbol Ag) has the Atomic Number of 47. The number of protons in atom of silver is therefore 47. Silver has the Atomic Mass weight of 107.87. Round to the nearest whole number. The mass number of silver is therefore 108. Example 3 - mass number of Neon: The element Neon (Symbol Ne) has the Atomic Number of 10. The number of protons in atom of neon is therefore 10. Neon has the Atomic Mass weight of 20.18. Round to the nearest whole number. The mass number of neon is therefore 20. The details all of the elements in the Periodic table, the numbers of protons, the numbers of neutrons and the mass numbers of atoms which relate to the elements in the Periodic Table.